In early September, the light in the mountains of Jackson Hole quickens and sharpens, and a sense of fall and winter to come is so evident in the air. 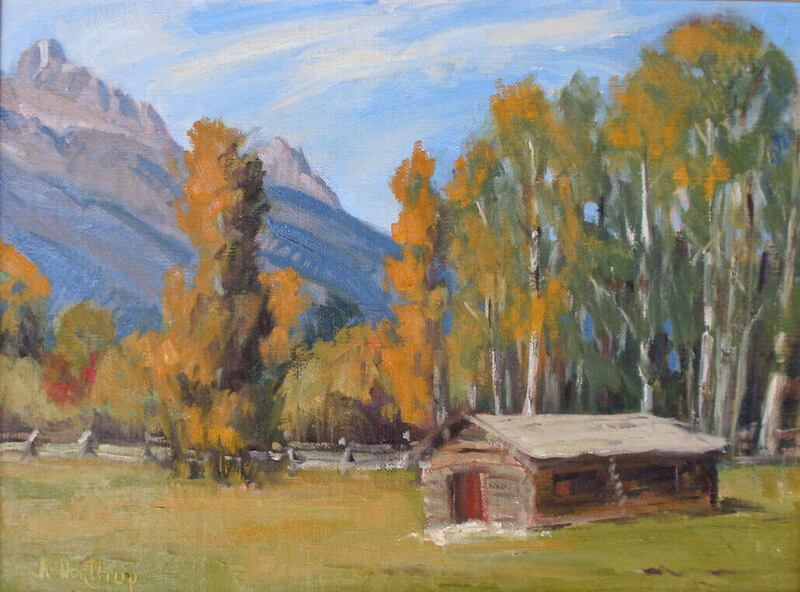 I had the good fortune to be assigned to paint at the R Lazy S Guest Ranch in September, courtesy of the Stirn family. The family has protected the entire 350-acre ranch with a conservation easement. As a result, the ranch is “so near and yet so far” from the bustling Teton Village, even though it nearly adjoins the Jackson Hole Mountain Resort. It is spectacularly quiet, with unsurpassed Teton vantage points, groves of aspen trees and wonderful traditional log buildings and barns. 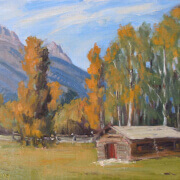 I chose my painting spot near the corrals looking over one of the preserved original buildings (from the old “Aspen Ranch”) to highlight the changing color of the trees. What beautiful weather! What a unique location! As the afternoon and my painting progressed, my only company had been two friendly mares in the corral… but I was soon to learn about the heart and soul of R Lazy S – riding! From four or five directions, guests on horseback, wranglers, and guides descended on the corrals and barns. It was a beehive of activity for an hour or more as they all arrived from their afternoon trail rides. What fun! And the best for me was to see a young guide whom I’ve known all his life but seldom see these days…Rob Brennan.